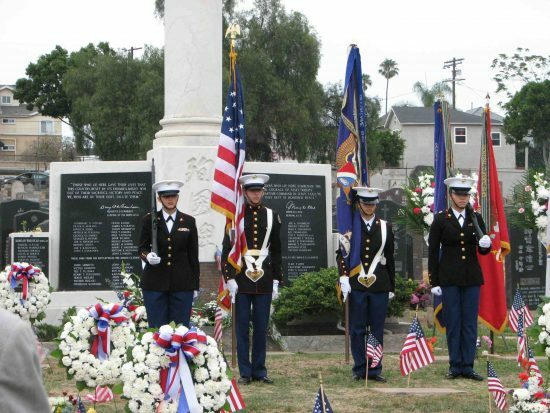 Sadao Munemori Post 321 will conduct the 69th Memorial Day service on Monday, May 28, at 11 a.m. at Evergreen Cemetery, 204 N. Evergreen Ave., Los Angeles. There will be no guest speaker. The honor roll reading by date of death will be given in its place. The chronological reading will follow in order of wars and unit engagements. Floral presentations will be made by Gold Star families, veterans’ organizations and Japanese American community groups. To start the ceremony there will be a formal presentation of the Medal of Honor wreaths at the gravesites of the four Medal of Honor recipients from the 442nd Regimental Combat Team – Sadao Munemori (A Company), Ted Tanouye (K Company), Kiyoshi Muranaga (F Company), and Joe Hayashi (K Company). The war memorial monument is inscribed with the names of local Japanese Americans killed in action from World War II, Korea, Vietnam and Iraq. The grave markers facing the monument serve as the final resting site for some of the KIA from World War II and the Korean War.